« National Haiku Day (Supposedly) in the middle of National Poetry Month! A rather silly poem for Kerry O’ Connor’s prompt on With Real Toads to write something inspired by quotes from Terry Pratchett or Leonard Nimoy. Terry Pratchett is one of my favorite authors ever, and has so many very inspiring quotes that have nothing to do with cats. I was working on something more serious but finally felt maybe I’d had enough of seriousness by this 18th day of April. Really, it should be the dog on the computer for purposes of this poem, but the cat took over. This entry was posted on April 18, 2015 at 7:59 pm and is filed under dog, poetry. You can subscribe via RSS 2.0 feed to this post's comments. I agree with Rosemary. This is delightful. Oh I can see the cat and the man here.. The way a feline talks is so well described. I’d have a dog over a cat any day, for all the reasons you have mentioned. In fact I have 3 dogs – no cats. Me too. But I am also very allergic to cats so unfair to them! Not silly at all. I’m more a dog person myself so I love this. Cats have feelings. I he had this attitude towards his ‘woman’ I would call it abuse. Poor kitty, scratch her neck and under her ear. Her mother thought she was beautiful. Oh dear. I am sure cats have feelings. I am allergic to them though! 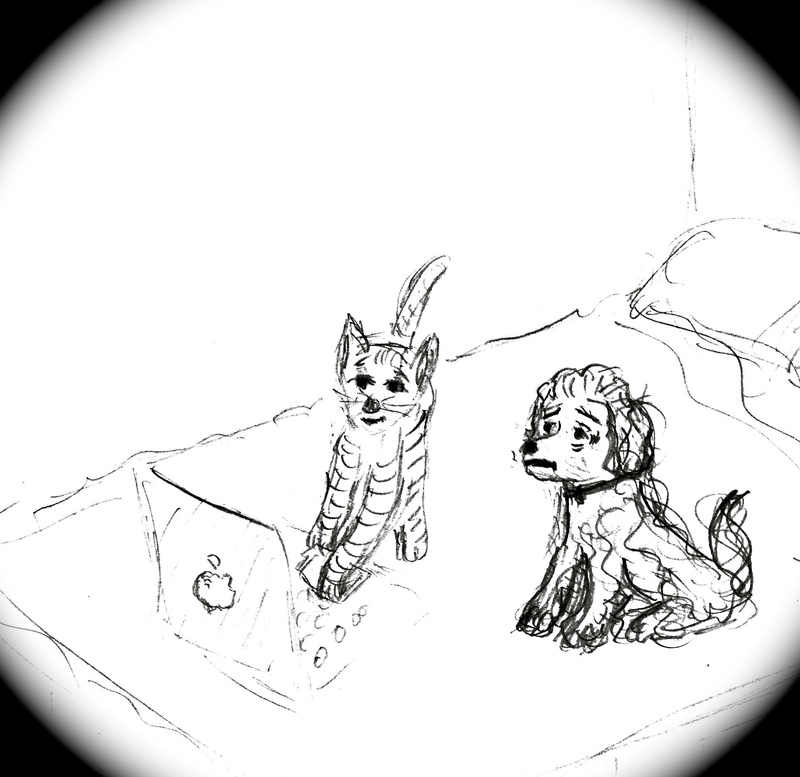 I always think of cats as female so tried making a male cat this time and female dog. But no abuse intended. k.